Real silver ribbon cable or a simple carbon flat cable? 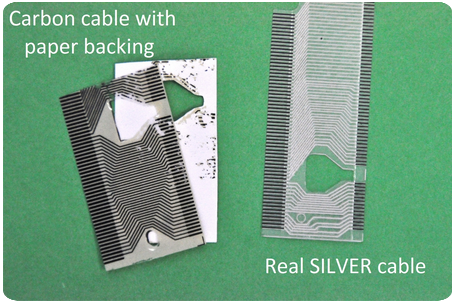 Real SILVER ribbon cables have a silver color conductive traces, as they are made of industrial silver. On normal ribbon cables these conductive patterns are black or grey, as those are made of graphite or similar material. Real SILVER flat cables do not need a T tip or soldering iron, these cables can be installed without heating or special soldering procedure. If you see a seller selling the cables as SILVER, but you need to buy a T tip for the installation, that means you are buying something else, not a real silver flat cable. Real SILVER cables have transparent base material. If it comes on a paper backing which is not transparent, it is a cheap Chinese ribbon cable. Real SILVER flat cables come with lifetime warranty. Once a silver ribbon cable built in properly, it will last for a lifetime, even is the car is kept under direct sunshine, or in extreme cold. Industrial silver costs money. If you find a seller selling flat cables for 10 Euros or so, you can make sure it is not real silver, it is something else. Is silver ribbon cable any better? Well, you'll find the answer here.